There are people all over who love cycling and the ranks are growing all the time. People who are interested in cycling should take the time to consider that there are hazards involved, but if you take the proper measures you can cycle safely. Here are some great tips that will help you stay safe and enjoy your time on your bike. The first thing you need to know to improve your cycling experience is the local laws regarding cycling. Be sure to obey all traffic laws. Avoid running red lights and stop signs. 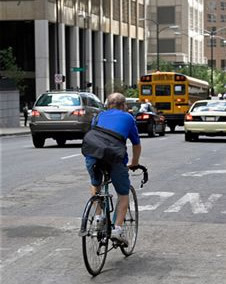 Cyclists have the right of way over motorists, it is still important to be respectful and follow rules. You are at a disadvantage on your bike so take care and motorists will show you the same respect. In most places, riding on the sidewalk or against traffic is illegal. When you are riding down the street, be sure to keep as far right as possible. Be careful of curbs. You want to leave enough space between you and the curb that you don't accidentally hit it and wreck. There are exceptions to staying right, such as making a left turn, but always be sure to use proper hand signals. If you are riding in traffic and they are proceeding as the same speed as you, it might be best to join in with them. This will make you more visible to them. No matter what you do, be sure that you avoid passing anyone on the right. Not only is this illegal, but it is dangerous. Motorists aren't used to having someone approach and pass on that side so they are less likely to see you. Whenever you are out cycling, always be sure to wear bright colored clothing. This will make you more visible to motorists, especially at night. Also be sure that you wear a helmet. In the event of a collision or a wreck this will protect you from head injuries. One of the best ways to make sure people notice you is to make eye contact with them. This way they are aware that you are a person and they need to be more cautious when you are passing. Making eye contact carries a lot of weight so make sure that you make eye contact with as many people as possible while staying safe and paying attention to the road. When you are cycling in traffic, be sure to make moves that are predictable by motorists around you. People who weave around and make erratic movements are more likely to be in an accident because motorists are not sure what to expect. Never ever leave the street for a moment and quickly return to it a few feet later and definitely do not weave through cars that are parked. No matter what is going on, be sure that you keep at least one hand on your handlebars at all times. This is where the break and steering mechanism are located. If you remove your hands you are putting yourself at risk for in the event that something dangerous happens. Also be sure to keep your breaks in good condition, you never know when they can save your life. Always keep your eyes peeled for potential obstacles when cycling. Know if a car is coming behind you and watch for hazards that may be in the road. Being aware of things makes you more prepared if one of them presents a problem that must be avoided.